Monday January 4 1909 It was a warm cloudy day though it did not rain I washed and did a lot of cleaning up in the forenoon Will and I went down to Woolfs in afternoon. I brought the clothes in and finished drying them by the fire. Tuesday January 5 1909 Mother is 83 years old today. I was busy with churning and baking a cake to take down home. I went at 3.12 Will came at 6.12. Mother had gone down to Otts and he brought her home at supper time. She was surprised We had a very pleasant evening. It had turned very cold. 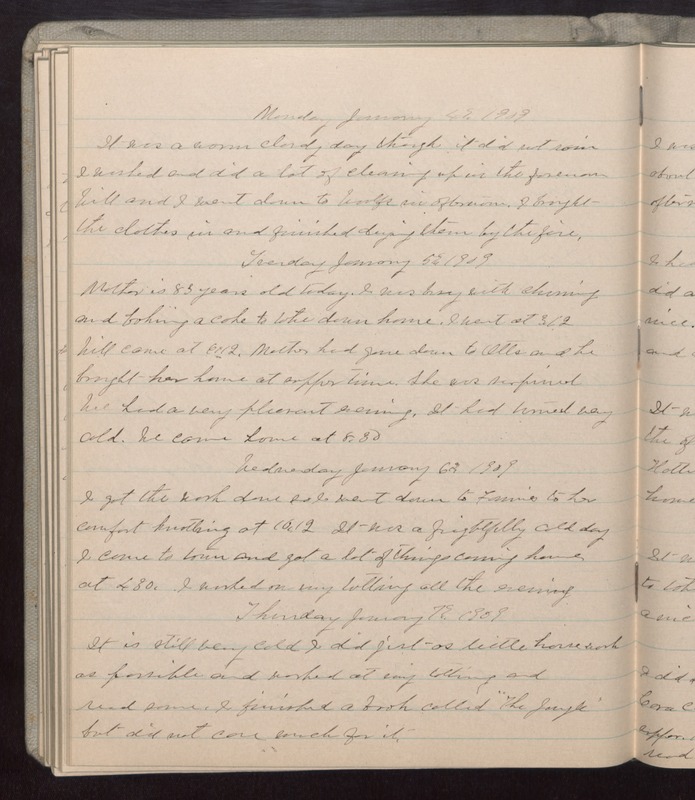 We came home at 8.30 Wednesday January 6 1909 I got the work done so I went down to Fannies to her comfort [illegible] at 10.12 It was a frightfully cold day I came to town and got a lot of things coming home at 4.30. I worked on my tatting all the evening Thursday January 7 1909 It is still very cold I did jist as little house work as possible and worked at my tatting and read some. I finished a book called "The [Jungle?]" but did not care much for it.